About a year and a half ago I went on a Cotic demo day on my local trails at Rivington. I was very impressed with the first generation FlareMax and RocketMax – but couldn’t buy either because the large-sized frames (with the reach I needed) had seat tubes which were too high for my stumpy legs. Still, I was so impressed with them that I did go on to build up a Solaris frame, which I’ve really enjoyed riding despite it being “too short” compared to my other bikes. Longer than the average bike, and lower as well. In the meantime Cotic clearly paid very close attention to my previous blog, because they went on to unveil their “longshot” geometry concept – which extends their frames’ reach significantly while also lowering the seat tube a good amount. This means that they are now one of very few brands making bikes which I can actually ride a medium confidently, despite only being 5ft 7in. And if I wanted to I could also fit on a large and still drop the saddle more than enough. 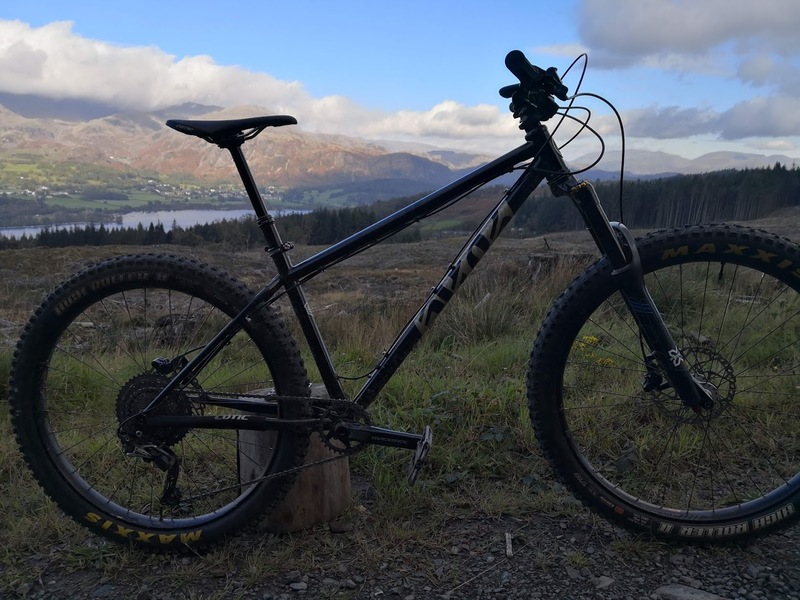 While I’ve got on really well with my Solaris mk2 for XC rides – and the odd local race – I must admit that I’ve found it a bit of a handful on steeper trails. The high BB and steep-ish head angle mean that it has an alarming “pivoting-over-the-front-wheel” feel when I hit bumps on steep sections. This isn’t such an issue with B-plus wheels installed – when it feels like a cross between a BMX and a hovercraft – but the geometry of the newest SolarisMax ws very appealing. Riding a little warm-up lap of “The Viking” at Grizedale before demo man Sam arrived, we discovered that the hill had seen a bit of rain overnight and the conditions were greasy and treacherous. So while I’d been intended to demo the medium Solaris in 29er format, I was unexpectedly relieved to see Sam pull it from the van wearing B-plus wheels with 2.8in High Rollers. The long drag up the Lawson Park fire-road climb was steady, with the chubby tyres proving slightly less draggy than I’d expected considering they’re much more knobbly than my own plus tyres. The reach of 460mm and 444mm chainstays offered a riding position very similar to my full-sus bikes – with a head angle in the same ballpark too (a bit under 66deg). Riding across Parkamoor was well within the bike’s capabilities, with the punchy little climb from the farmhouse tackled easily and the big tyres absorbing the bumps on the fast, slightly rocky BW. Tony, Sam and Andy trying not to get their feet wet on Parkamoor. The real sit-up-and-take-notice moment was riding the “Three Witches” (aka “Dad, Grandad and the Dentist” down to Satterthwaite. 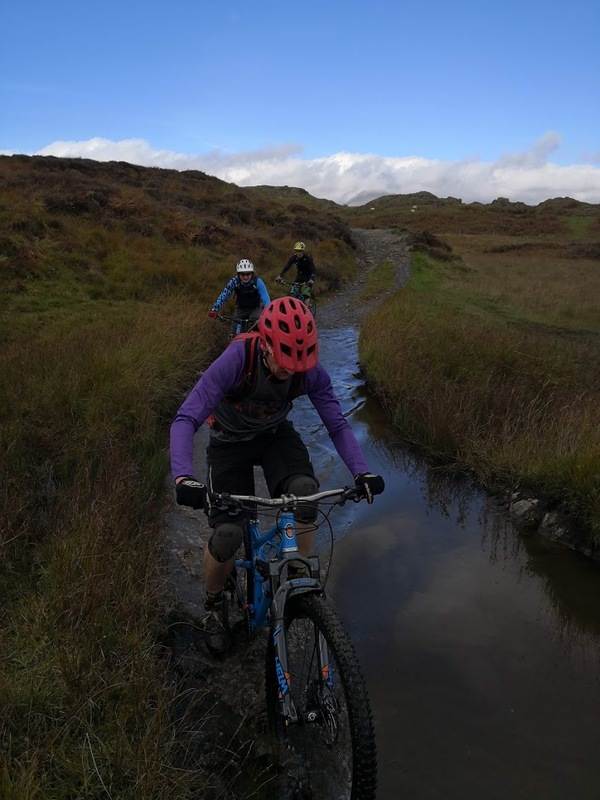 A set of three pedally and rocky bridleway descents, it’s one of the best-known and best-loved trails in the area and is usually ridden quickest on an enduro bike or a mid-travel 29er – so I was expecting a rough ride and perhaps even a flat tyre taking the Solaris down it. So I was pleasantly surprised that the bike ate it all up, feeling impressively planted and grippy – to the point where I felt that I was riding way too slowly. Initially I’d set off ahead of the others in case of a puncture, but after holding the gate and launching into the final section last I found I had no trouble at all staying in contact with the full-sussers, even considering a cheeky overtake. It was only on the fast, rougher section at the bottom that I had to back off just a touch and lost a few metres. Climbing up Breasty Haw was a touch easier than normal thanks to the acres of grip offered by the big knobbly tyres, and bike felt stable and surefooted on the rocks and off-camber slabs of the “Red Mist” descent that followed. One spot that the Solaris did languish behind the others on their FlareMaxes was the steep, loose climb back up after this – where the rigid rear led to my wheel spinning as theirs stayed stuck to the ground (though they did both have 50t crawler gears too). I was expecting the “Babies Heads” run down to the visitor centre to be where the bike would really find it’s limits, as it’s a flat out rocky blast where you tend to use all your bike’s suspension and still let it move around underneath you. However I had no trouble staying in touch with Sam on his Rocket, only backing off because I was getting a face full of water spray presumably from his back wheel. Except it turned out to be from my front wheel, as the bike had no fender on the fork. Letting go of the brakes again, the big tyres and slack geometry allowed me to push on very nearly as hard as I would have done on my enduro bike. Quite an eye-opening experience – as was the whole ride on the SolarisMax. The progressive geometry, the forgiving feel of those long steel tubes and the amazing grip from the big HR2s work together to create a bike that honestly is as fast – or faster at times – than some full-sussers. I will be buying one, for sure. I don’t smile like that at the end of every ride you know. After a quick stop at the visitor centre I swapped bikes with Tony, climbing aboard Sam’s personal FlareMax (kindly offered because we were all medium-sized). As I remembered from my previous demo, the bike had a nice perky pedaling action. It didn’t feel quite as lively to me as the mk 1, but it was notably quicker than the Solaris in B-plus form – and I was able to tackle the awkward bits on the North face climb with ease (the Eagle cassette may have helped there too). The first descent felt good, but it was a bit odd suddenly switching to 760mm-wide bars. By the next second descent however, “The Viking” again, I’d totally clicked with the bike and found it intuitive to move around and weight the wheels on the tricky rooty bits. The 130mm front / 120mm rear suspension was plenty enough to handle the enduro race stage – perhaps even the ideal amount. The ride feel from the steel frame, the Cane Creek DB IL shock and Helm fork was sublime, giving a nicely damped ride that still felt efficient and communicative. I believe I got a Strava PB on part of the long descent – which I’ve ridden many times in the past. I won’t be buying a FlareMax now though, partly because I’m not made of money but also because the bike is heavier than my Orange Stage 6 and doesn’t have any advantage in pedal efficiency – so that makes more sense for my riding at the moment. It would make a great main bike for a lot of people though, as with the Solaris, the geometry really trumps the lack of travel and it is capable of much more than people might expect. It’s certainly the best short travel 29er I’ve ridden for the gnarlier end of things. 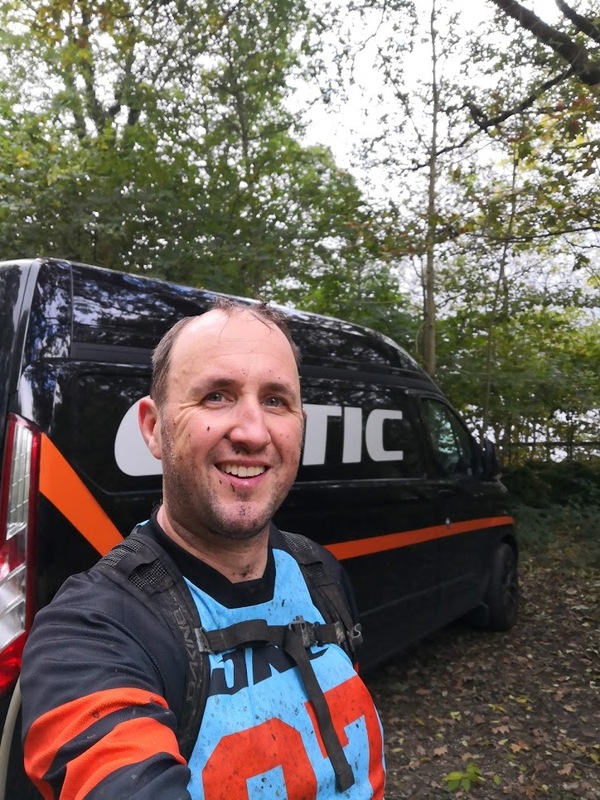 Before I wrap up I should also mention Cotic’s great demo system, which enabled me to email Sam and set up for him to come to Grizedale on a Tuesday to ride with just a few of us. This gave me the chance to ride the bike I was interested in buying on a variety of challenging trails that I know well for about four hours – all at no charge and with no hard sell. The whole thing just felt like going for a ride with your mates. This helpful, customer-focused system gives a great impression of Cotic as a company and does reinforce my decision to buy the Solaris. Hi Stace, loving these very informative reviews! How did you find the seat angle on the Solaris? Glad you liked it Andy, it’s funny you mention the seat tube – I was saying to someone else the medium is pretty much the exact geometry I’d want if I were going custom, apart from maybe a slightly steeper ST. I did stop to push the saddle forward on its rails about as far as it’d go and it was fine for me then. Howdie mate, glad I found this review. I’m a rivi rider and would be interested to know how the bike performed down special-k ( secret track?) the Belmont decent and the ice cream run. Solarismax top of my list for next years bike, your opinions would be welcomed. Hi Kev and cheers for the kind words, the SolarisMax is pretty good at Rivi, even down ICR and the secret stuff, because it’s pretty slack and long. Not as fast or comfy as a FS bike though obvs. I’m avoiding that one. I don’t wanna try the new RocketMax in case it’s too good.